Through our voluntary charitable giving program, Linhart-to-Heart, employees get the opportunity to choose a local nonprofit organization to benefit from their generosity through time, money, or gifts. Through our voluntary charitable giving program, Linhart-to-Heart, employees get the opportunity to choose a local nonprofit organization to benefit from their generosity through time, money, or gifts. Our 27-member Linhart Public Relations firm decided to give back to two organizations in need in our Denver community this holiday season: Florence Crittenton Services of Colorado and Denver Kids. 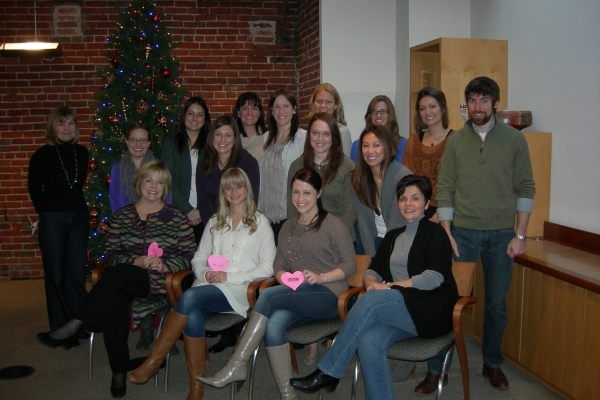 Team members adopted 25 children and moms by selecting “ornaments” from the organization's giving tree. Each ornament tag is labeled with the gift wishes of the kids. Team members are taking time out of their weekends, lunch breaks, or evenings to shop for the requested gifts (we have a budget of $400 for these special 25 kids) that will put a smile not only on the children of these teen parents this year, but also the proud teen moms and dads. Denver Kids helps Denver Public Schools' students facing the personal challenge of higher-risk environments successfully complete high school and become productive members of the community. Compared to the 54% high school graduate rate of the Denver Public Schools, students involved with Denver Kids have about a 94% graduation rate. This holiday season, Linhart PR is providing Denver Kids with grocery store gift cards that will allow families to purchase food for a special Christmas meal. At Linhart PR, giving back to the community where its employees live, work, and play is part of doing business—and it's the right thing to do. Both of these programs are important to Linhart PR because they help families in need during the holiday season and offer us another way to give back to others.